As every photographer knows, all photo shoots have the possibility of unforeseen obstacles, no matter how perfectly planned. What distinguishes a good photographer from the others is the capacity to adapt and compensate for challenges that cannot be controlled. My recent trip with the Sony Alpha Imaging Collective to Acadia National Park was a constant struggle with less than ideal conditions. Time after time, we expected to photograph a bucolic forest or a stunning sunrise. Instead we were greeted by dull, gray skies, torrential downpours or overcrowded locations. Yet these challenges were not only intriguing, but once mitigated, provided me with confidence which led me to create some strong photos. All was quiet as we rose at 4:30 AM to behold the first place which greets the sun in America. We stumbled sleepily around the dark summit of Mount Cadillac. Yet the more the darkness lifted, the more it become evident that we were not the only ones here. Dozens then hundreds of shapes materialized as other photographers were revealed. It soon became a game of seeing who could move closer to the edge of the high ground, so as to capture the sunrise best. I must have repositioned myself 10 to 15 times. Regardless, I had something few had on this mountain top: my Sony α7R II with its awesome dynamic range, which was about to rage on the dawn sun. At ISO 100, this beast of a machine gets close to 14 stops of dynamic range. The next day we stopped at the Asticou Azalea Garden. This beautifully planned garden was quite a contrast to the dramatic Maine coastline with its many pines jotting the landscape. Unfortunately, an overcast sky with an intermittent drizzle dulled the lush flora around us. I attempted some of the usual photographic compositional concepts; a reflection here, a close up detail with some depth of field there, but nothing materialized of value. Then I remembered that the most compelling photographs always involve a human subject. I asked Lisa Bao (@lisabao) to immerse herself inside this leafy bush, with only her face visible. I switched to my 55mm f/1.8 lens and, finally, I managed to achieve something compelling. Even with the lack of sunlight the results were strong. Soon after, the whole team stopped for a shooting opportunity at a rustic stone-arched roadway bridge. However, minutes after we all disembarked, a torrential downpour fell upon us. With my two newfound Alpha Collective amigos, Andrew (@andreweggers) and Anthony (@theanthonycastro), I managed some creative photos with the road and that defining center yellow stripe. 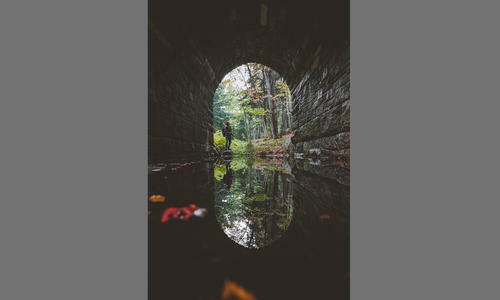 We became thoroughly soaked and as we sought a respite from the elements under the bridge, we soon sought opportunities under the covered arches. On one of the secondary arches, a large puddle had amassed. I asked Anthony to pose opposite me. To achieve any good reflection, you must get yourself as low as possible. Positioning my camera just millimeters above the water’s surface, the wide angle 16-35mm G Master lens made the puddle seem a like a virtual lake. Also utilizing the rule of thirds grid line in the viewfinder, I composed my favorite photo of the weekend. The powerful lesson here is use what you have, and even with limitations you can find that engaging element that will make the shot. Day in and day out I felt my creative flow steadily gaining momentum. So what was the last component in my “make lemonade out of lemons” adventure? Work collaboratively. It sounds so simple, but is it? Many speak of it, but to truly benefit, one must embrace it fully and wholly. There is no “me”. No “I want this photo to be better than what the others do”. No “I don’t know if I want to share my perfect spot with them” With those thoughts you will only go so far. I truly believe that the collective mind generates a higher level of art. As Andrew, Anthony and I spent more time thinking, talking and shooting, the ideas just flowed and the level of photography kept climbing. This photo (image 5) celebrates this. In this ancient forest, we all added and contributed to the equation; Anthony and his “sleeping bag” idea, Andrew with his thoughts on the proper lens and me with plans on framing. The sum was superior to anything I could have done on my own. Of course a tropical sunset with a stunning model makes glorious photographs, but the scenario where you have to exert effort, ingenuity, and teamwork will ultimately create a more gratifying and memorable image.